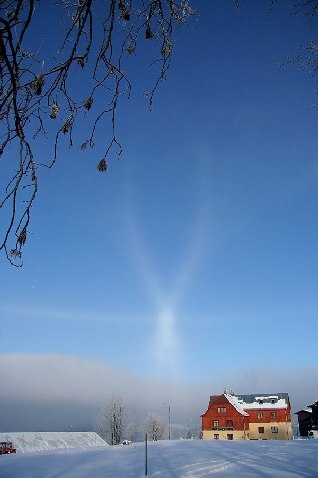 On 10 January 2009, Jan Smejkal observed a complex display in Prichovice, in which some rarer halo forms - such as the anthelion brightened by crossing Tricker arcs - were in action, too. The more frequent halo arcs included suncave and sunvex Parrys, Wegener, a faint helic, upper Tape arcs and subhelic arc ( 1 – 2 – 3 – 4 – 5 – 6 – 7 ). The photos also show a weak Liljequist parhelion ( 8 ). Jan Smejkal described the weather during the complex halo in the following way: "On 10 January 2009, Prichovice was slightly above inversion, and time to time some very thin clouds crossed the sun. 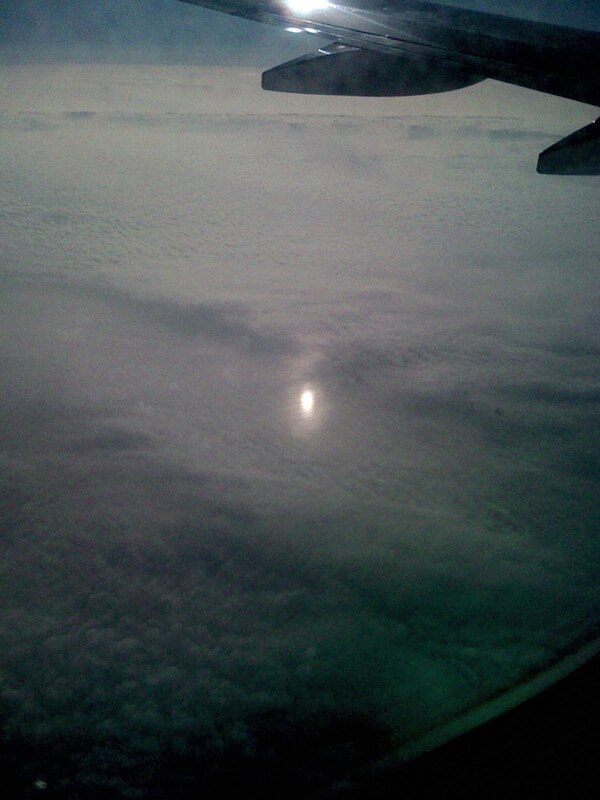 The display was observed at different intesities from around 9:00 until 11:30UTC when the sun got covered by clouds." More information on the Czech diamond dust displays can be found in some articles at the following site: ( 9 ). 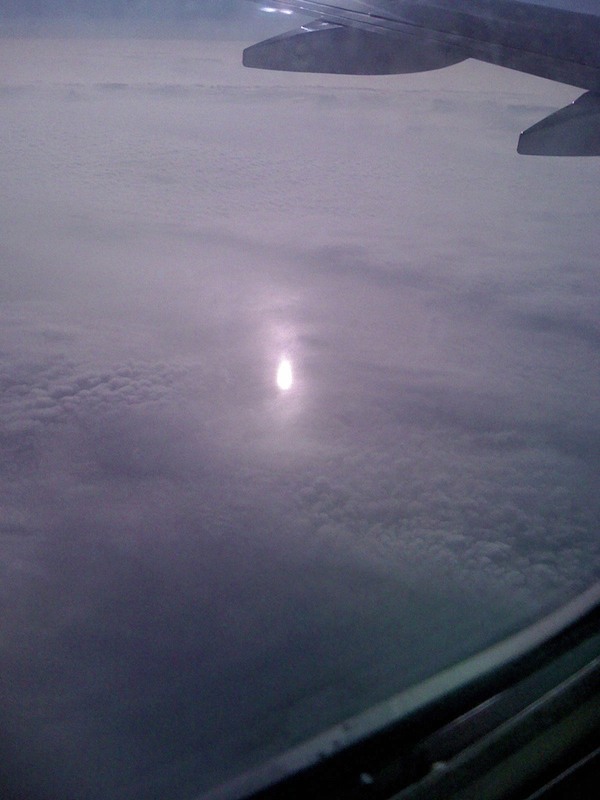 The photo on the right, and another one ( 1 ) were taken on an airplane from Beijing to Singapore on 3 January. The Bottlinger Rings appeared two times in total, when the plane flew above patches of dissipating AC clouds. I only managed to capture the first appearance. When the rings appeared, the subsun was glaring, and I got a feeling of the ring swelling and shrinking as the cloud moved, but I guessed it was only an illusion. 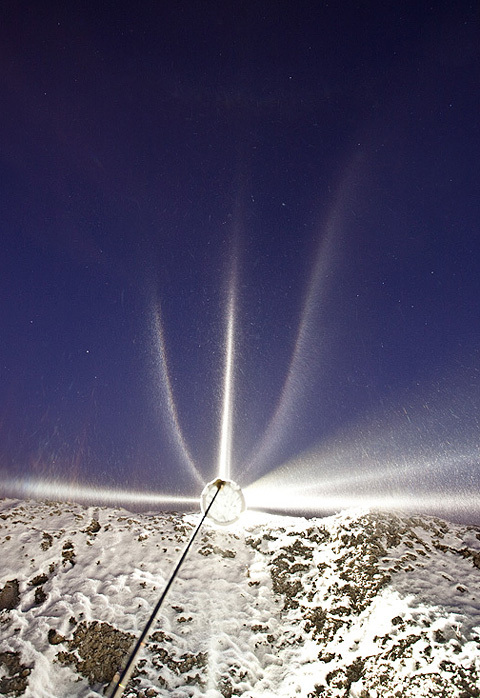 The display developed soon after the snow guns were started at 21:30 and began vanishing no earlier than 05 in the morning when Ac clouds rolled over. It was an unusually stable display, the swarm stayed in the same location and there were no much changes in the halo composition. Jari Luomanen ( 1 ) and Mika Aho ( 2 ) photographed the display and took videos in the spotlight beam. I sampled crystals ( 3 - 4 - 5 ). Wegener arcs were full and both lower Parrys were visible. 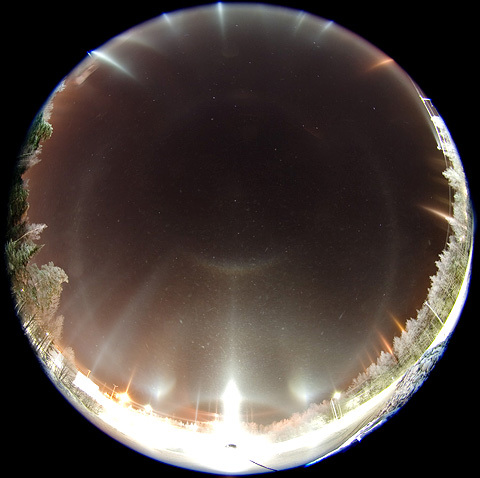 Diamond dust halos were observed also in Sievi by Marko Mikkilä ( 6 ) and in Hyvinkää by Jukka Ruoskanen ( 7 ). In the image above the two photos in rigth hand column represent intense pillarforests with superparhelia rising from nearby lamps. The sight is very impressive as tens of lamps around the observer create pillars. Furthermore, one can see a long circumzenith arc, as all the lamps contribute to it ( 1 ). Some interesting halo geometries come about when one approaches a spotlight and the light rays become ever more divergent. In the leftmost column there are two examples of that. In the upper photo both car headlights are the light source, and peculiar arcs are formed each side of the lamps. A strong feeling is that these are superparhelia-related. In the lower photo the camera is only 5 meters from the spotlight and almost outside the strongest beam. The shape of the subparhelia gets distorted in a funny way. That effect can also be seen in Jari Luomanen's photo ( 2 ). So far we have no definite answer to the origin of these halos, but surely they are a result of quite complex geometries involved in divergent light scattering and represent distorted images of ordinary haloforms. These photos are important in correctness evaluation of divergent light simulation code. Should anyone reading this want to shoot similar images, I suggest that the relative distances are carefully noted so that comparison with simulations can be done. 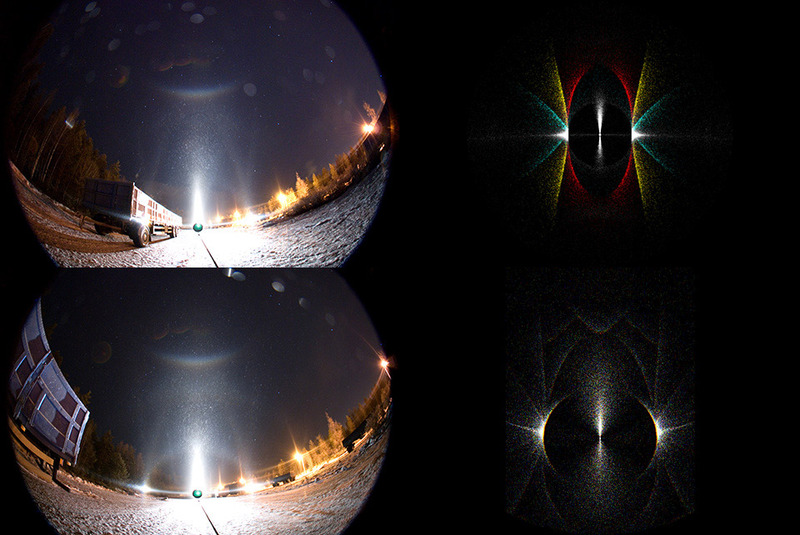 During the night between 2nd and 3rd January the divergent-light 120° parhelion was seen as well ( 3 ) and some crystals were collected and photographed at the same time ( 4 - 5 ). Sub-Kern, although already documented by Riikonen ( 1 ), was in the back of my mind when the plate crystal swarm got better in the night between 1st and 2nd January 2008. I was forced to photograph in a light-polluted parking lot, but immediately when lying on my back I could see something encircling the zenith. Pretty soon it came to me: sub-Kern and circumnadirarc. Despite the poor contrast conditions the halo shows up well in the photos, as expected since it could be seen visually as well. Next evening (2.-3.1.2008) the plate crystal swarm was very impressive again, and this time it lasted for several tens of minutes, but unfortunately the diamond dust cloud did not spread very far. I did not even consider phtographing with the spotlight due to the surrounding streetlights. I did take one photo of the subKern on a dark field in the edge of the crystal area where the crystal density had decreased significantly ( 2 ). All photos from these two nights are in their own galleries ( 3 - 4 ). 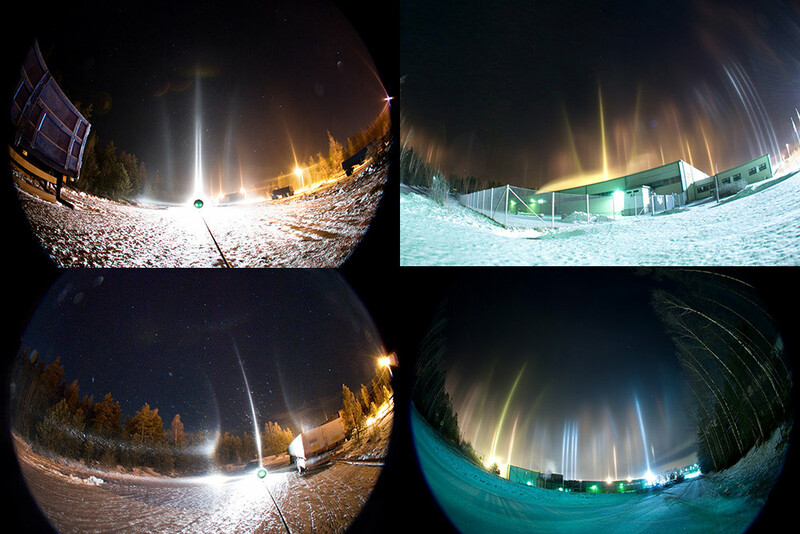 Reflected Lowitz arcs were seen for a short period of time in Hyvinkää, Finland, on the very first day of the year. I used the spotlight as a light source. In the beginning of the night fierce pillars formed above each and every lamp there was. This esthetically impressive (but rather poor from halo viewpoint) stage started to transform into something better when superparhelia appeared. I had no time to waste and started to look for a suitable place to take photographs with the spotlight. The crystals did not spread very far, so I had to settle for a concise and light-polluted parking lot. There the reflected Lowitz arcs revealed themselves. The lamp as seen with the camera eye is 1.5° below the horizon. In the upper part of the image above the three reflected Lowitz components are illustrated. The red (raypath 3-2-5) and yellow (4-2-6) components can be seen in the photos, but the third (cyan, 5-2-7) is missing. We have ideas, but no definite explanation for the relative intensities of the three components. Modifying the crystal into more tabular shape helps a bit to wipe out the cyan component from the simulations, but at the same time can cause undesired effects for the remaining two components. A crystal sample, as usual, would have been nice to have but the whole situation ended in 15 minutes during which time I did not manage to take samples. If you click the image above a larger version appears. In that there is a simulation showing the 46° contact arcs. These arcs are faint in the photos, but especially in the upper left corner photo the familiar shape of the 46° contact arcs can be seen. In the lower left corner photo their shape is more distorted, but the "46° halo" still suggests the presence of the 46° contact arcs. After several trials it became apparent that distorting the shape of the 46° contact arcs in the simulations is pretty difficult. This was confirmed in discussions with Marko Riikonen, who has a lot of research experience with Lowitz- and 46° contact arcs. So, once again a crystal sample could have shed some light on the issue. Typically, if there are randomly oriented crystals between the light and observer (in diamond dust) the 22° and 46° halos are complete and their intensities are homogeneous. In this display, howevever, the incompleteness of the halo in vicinity of 46° rules out the 46° halo. Instead, with the reflected Lowitz arcs in the display, one easily concludes that the faint halos 46° from the light source are indeed 46° contact arcs. More images from the night of 1st - 2nd January are here. 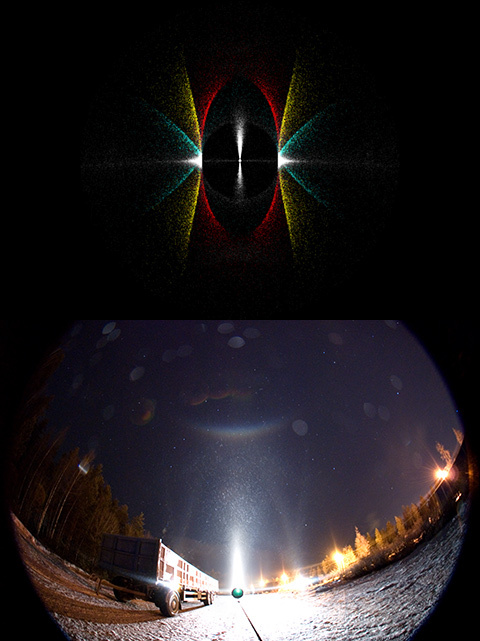 During the night of 2-3 January 2008 subhorizontal plate halos were observed in Tampere, Finland. 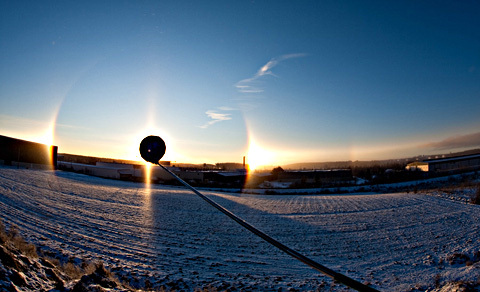 The Sub-Kern arc and circumnadiral arc (both first discovered by Marko Riikonen in Rovaniemi in December 2008) are the most noteworthy forms in the display. 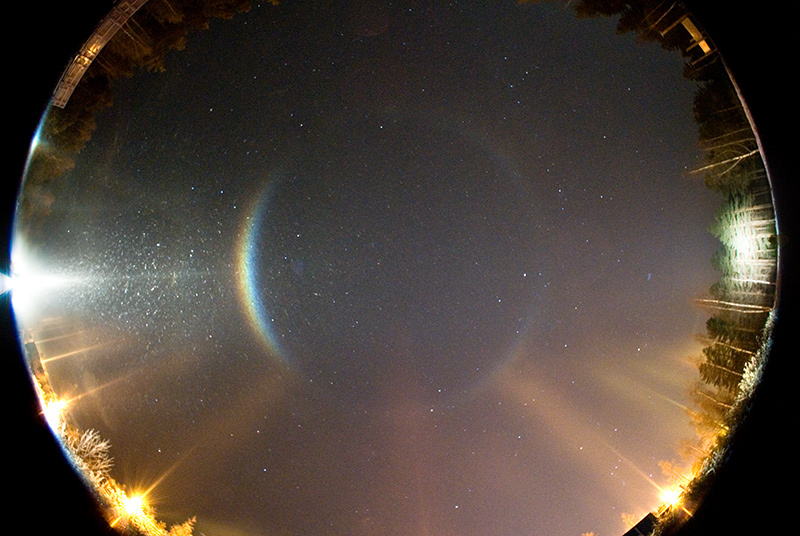 Among some of the more common halos, also the subparhelic circle ( 1 ) was observed. Superparhelia are also seen in the main image. Furthermore, there appears to be a faint, illuminated spot right in the zenith (first observed by Marko Mikkilä) in many images. This phenomenon is unaccounted for. The subparhelia ( 2 ) appear to exhibit some type of lowitz forms, but this could also be due to divergent light effects. The subhorizontal helic arc is also a bit of a mystery as other parry forms seem to be missing. The lamp was at a negative elevation of ca. 11 degrees. Other images are also available online ( 3 ). In the morning of 2 January 2008 there was a very large swarm of diamond dust in Tampere, Finland. Bright parhelia and a 44 degree parhelion were observed. Pillars and subparhelia were also visible. 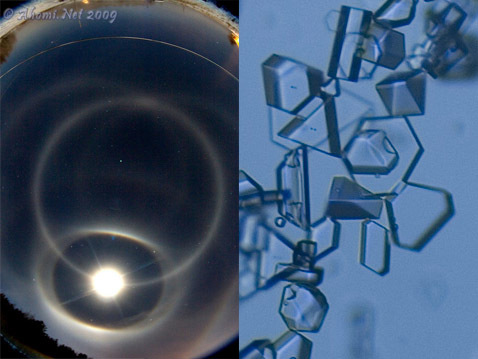 Structures deviating from the clean hexagonal form of an ideal ice crystal are believed to have an adverse effect on the formation of halos. Here we present images of a display and the large plate crystals that made it. We call these plates with inner structures decorated plates. 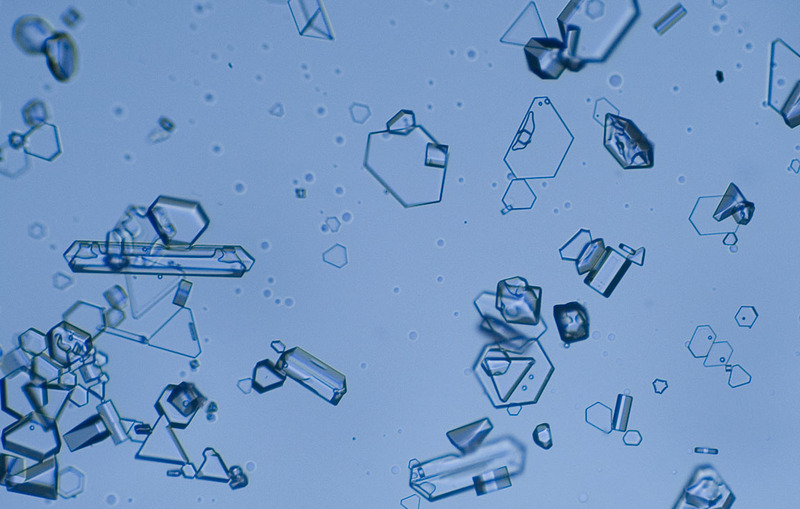 In addition to these decorations, the large crystal size also adversely affects halos as they tend to orient poorly. 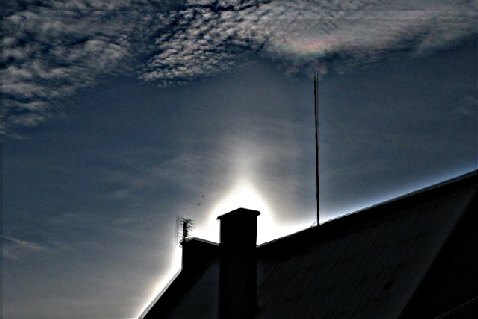 Parhelia and a pillar were constantly visible, while subparhelia only appeared occasionally ( 1 ) as better quality crystal drifted by. Since the lamp was placed below the horizon, we could not see whether the circumzenithal arc was present. The display occurred in Tampere in the morning of 4 January. 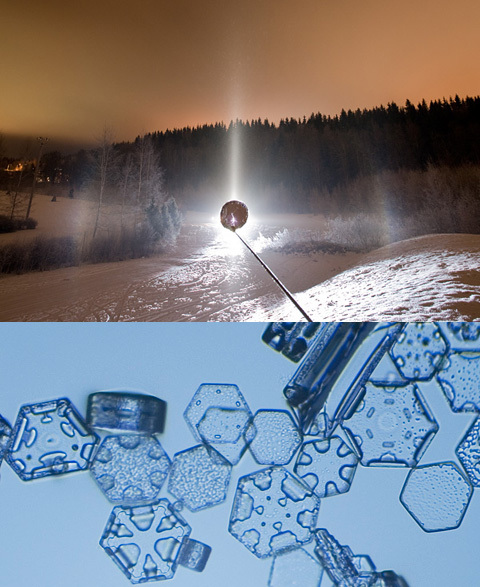 Marko Riikonen sampled the crystals ( 2 ) while Jari Luomanen photographed the display ( 3 ). On 26 December, diamond dust halos were captured by webcams (Hydronet network) at Lysa hora in Krkonose (Giant Mountains). In addition to the more usual phenomena, there were helic arc, Tape infralateral arc and Wegener arc in the sub-area. 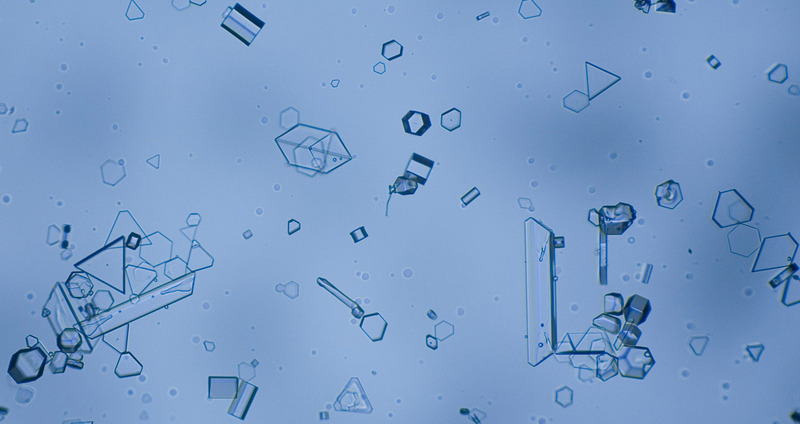 The Parry orientation of crystals may indicate possible Hastings arc ( 1 – 2 – 3 – 4 – 5 – 6 – 7 ). You can see all the photos from the west and south webcams located on Lysa hora at ( 8 ). On the same day, at the same place Jiri Zujic also made observations. Note the parhelion legs ( 9 ). 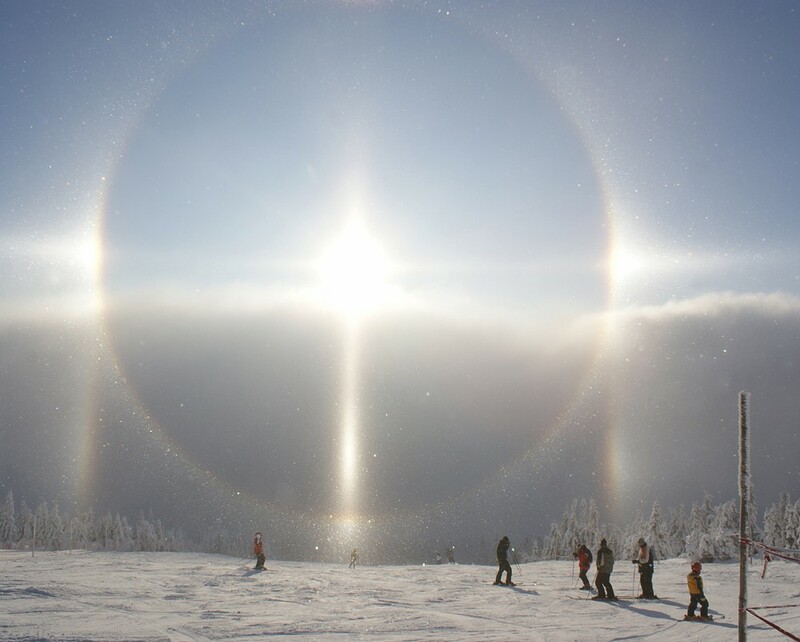 One picture from the webcam, placed on Certova hora in Krkonose, shows 120° parhelion ( 10 ).